​"I always keep a picture of Jane Austen's tiny writing table pinned over my desk; if six of the worlds greatest novels can be written on a tea table, then anything can be accomplished." ​I love this quote! 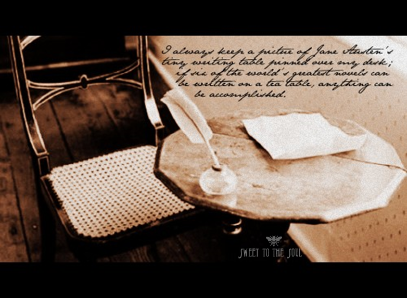 Not only because I am an avid Jane Austen fan and have read her six completed novels and can quote many lines from each; but because it brings me back to the reality of just how much - rather how little - is necessary to accomplish great things. ​Often we tell ourselves we cannot accomplish tasks because we do not “have” what is needed; whether equipment, supplies, time or training. We put off even making an attempt until all circumstances are “just right”. Our life becomes cluttered with un-accomplished tasks because we fail to even begin. Oh what we would have been deprived had Miss Austen chosen not to write a word of Ms. Bennett and Mr. Darcy because she did not have a perfect setting, or even an audience. ​How often do we have this same response when we hear the voice of God calling us into action -- to volunteer our time, to encourage someone hurting, or to speak of God’s love to another? Often, we feel we are not equipped, don’t know what to say, don’t have time. But the truth is that if God calls us into action, He will not only direct our path but will equip us to complete the task! He that is faithful in that which is least is faithful also in much. All too often we feel an accomplishment for Christ must be huge to be impactful; and this too can prevent us from even attempting to help. But how much more are we touched by a single individual who has taken a moment of time to pray with us, cry with us or even give a hug at just the right moment? So often these seemingly small gestures of caring have a much greater impact on a person than sermons with a large crowd! to accomplish humble tasks as though they were great and noble. ​Not many are called to be a Jane Austen or a Billy Graham, but most of us every day are presented with an opportunity to minister to another through God’s love. ​Be the subtle voice that helps another in need. and Katy McCown at A Football Wife's Life for RaRaLink up. Would love for you to stop by for a visit! Jana, excellent post, and how true! We feel we need everything in place before we take the first step of obedience! Often, if we would just take that first step, we would see how the Lord equips us, and our faith would be strengthened! I am so guilty of this Ellen. Even before starting to blog, or starting my ministry... I thought everything had to be just right, when really I just needed to be willing and say Yes to God. So many people need to read this post, Jana. I struggle with this often, and it's easy to think we're not making an impact when we look at men or women who are evangelizing thousands and doing amazing things. But if we aren't faithful in the little things, why would God entrust us with more. Thank you for sharing. So much truth here. That's me Abby! and I have to keep telling myself that very thing daily... God will bring/send whoever needs to hear, and if it's only one, then that's ok! Oh I love this Jana! I love the call to keep our eyes and ears open to the prompting of the Lord... to be willing to step out and offer prayer or a friendly shoulder... so often we can say in passing, "Oh, I will pray for you!" but lately I am trying to be more intentional in saying, "Oh, can I pray for you right now?" It only takes a moment and people are almost always willing to be prayed for! Great post!